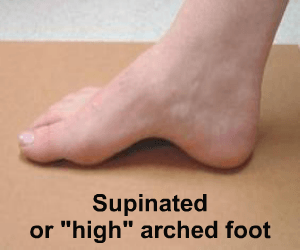 The supinated foot or "under pronator"
Under pronation, supinated or the high arched type foot are all terms used for feet that give the appearance of rolling outward onto the outside edge of the foot. The under pronated foot, high arched or supinated foot is a little more unusual in comparison to the supinated foot. It is generally a "stiif" foot and often patients have less movement around some of the key joints that allow the foot to work normally. The high arched foot often has too little shock absorption as the foot does not pronate or roll in (normally to absorb the shock on impact) as it should when first making contact with the ground in walking or running. The high arched foot oftem means that less of the foot is in contact with the ground, meaning some areas of the foot take more pressure than normal. the conditions relating to the high arched foot are often similar in nature to those in the over pronating foot, simple due to the altered biomechanics both conditions cause. A high arch in itself is not necessarily a problem but if you experience pain in any of the areas described above. A biomechanical assessment is always advisable to establish why you may have these issues, and how you may help reduce these symptoms. Our biomechanical assessment clinic in Hamilton (near Glasgow) can help you with this. How do you treat symptoms from the under pronating "high arched" foot? The main issues with the high arched foot are that it lacks the same level of shock absorption that is present with a foot that pronates. And so often they require additional cusihioning. Also as the arch is higher than normal it means less of the foot is in contact with the ground and therefore there can be high pressure points underneath the foot. 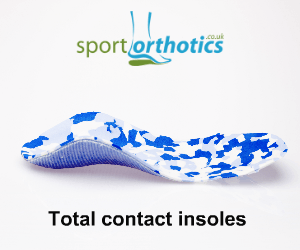 Orthotics which provide cusioning, increase the area in contact the ground and promote a more natural gait pattern are all reasons for prescribing orthotics for the under pronator or high arch foot. Like the over pronating or flat foot type it is important that a biomechanical assessment is undertaken to establish why you may be having issues. Having a high arch alone is not necessary significant or mean you would have pain. However, if you have symptoms (pain or discomfort in your leg) and you have a high arch then you may well benefit from orthotics or insoles to improve the way your foot fuctions on activity.